I had the good fortune of attending Friday night’s debut of Disney On Ice Presents Pixar’s The Incredibles In A Magic Kingdom Adventure. The show, which played to a sizeable audience of hundreds at The Lakeland Center in Lakeland, FL, was a, needless to say, “Incredible” performance. 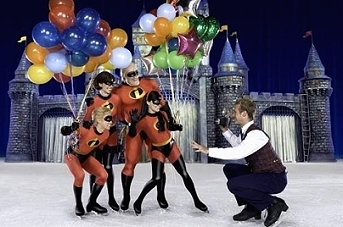 The Incredibles On Ice is actually in celebration of both the movie and Disney’s recent 50th anniversary. Taking place shortly after the movie’s end, the plot center’s around the Parr family’s eventful trip to Disney World and the Magic Kingdom. The fit between movie and ice show is so perfect that one might imagine a reporter having asked, “Mr. Incredible, you just defeated Syndrome, what are you going to do now?” On their vacation the Super family runs into a number of fantastic and mundane adventures that keep the audience in stitches throughout the evening. Even with its unique combination, the show has a wonderful balance of The Incredibles and the Magic Kingdom showing both in exciting ways. It also features a number of favorite characters from the movie (including Frozone, of course) and brings to life beautiful reincarnations of several of the theme parks most loved attractions. Breathtaking choreography along with an exciting score that has a variety of songs and styles captures the hearts of the young and old alike. While the show is a musical that features singing and skating by live performers made up as the Incredible family and other classic Disney characters, the change of formats does not detract from the experience. In wigs and make up with a doll for Jack-Jack, the family makes a smooth transition from CGI into real life. Scenes range from exciting battles that leave you on the edge of your seat to comical Super disasters that made me laugh so hard I scared the kids in front of me. The creators also show great ingenuity in displaying the family’s powers through trick props and technical effects. According to sources, surprisingly Brad Bird and Pixar were almost entirely hands off from a production that was so true to the spirit of their creation. Although he and Pixar did approve the script, the movie’s writer/director did little else and the design was left primarily in the hands of Disney On Ice’s creative team. The group was successful in bringing back most of the original voice actors for authenticity and also took great care to avoid conflict with the original animated feature. Off the ice, the atmosphere was also exhilarating as several merchandise stands offered exclusive products that put a $250 dent in my wallet (I bought one of everything). The kids and myself all looked great in our Incredibles wigs and masks, along with special arm bands that were key to an interactive scene with the audience. Snow cones were also served in collector’s mugs featuring three sizes (Bob, Dash, and Jack-Jack) making the night complete, absolutely “Incredible”, and certainly on “Parr” with other Disney On Ice shows! 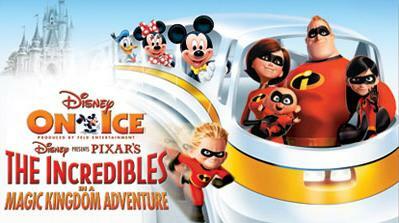 For more on this and other Disney On Ice productions, check out the Disney On Ice website for show times and locations.